By Irvin Air Chute of G.B. Ltd. (I.A.C. ), Parachute Assembly, Type S., MK.18, Stores reference 15A/1533. 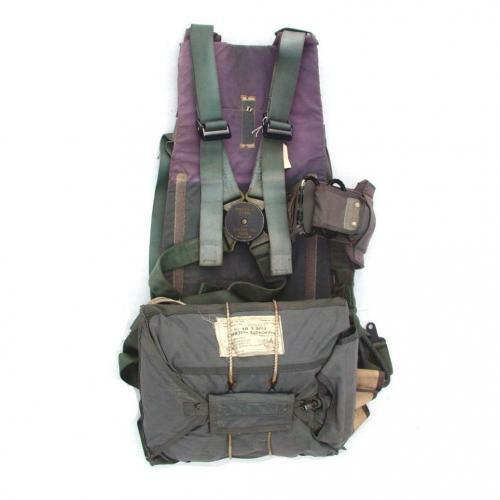 Designed for use with ejection seats type 2CA/1 MK.1 and 2CA/2 MK.1, 2, 3 and 4, within Canberra and other aircraft. It features an I.A.C. Harness, Type C, MK.15 - stores reference 15A/1579, blue-grey nylon webbing with quick adjustable buckles on both the front suspenstion and leg straps. It also features an intertia-proof quick release box and twin D-handles on the waistbelt. The first handle (closest to the QR box) disconnects the parachute withdrawl line; when pulled it exposes the second handle which may then be used to deploy the parachute independently of the ejection seat automatic withdrawl device. The I.A.C. Pack, Type S, Mk.9 - stores reference 15A/1580 carried both the main and drogue canopies. Fitted with matching backpad, Type B, MK.43, stores reference 15A/1581. The assembly is quite complete with all the harness and buckles in good order bar normal soiling and fading. Each component is separately labelled with reference numbers and dates. The pack is in good order but the backpad has colour fading/change and the optional 'velcro' attached lumbar cushion is absent. The harness and pack are both 1967/8 dated and have matching serial numbers indicating that they have always been together. The pack appears to be have the original canopy and drogue in place and the harness comes with both rip-cord handles, housings etc. An interesting postwar variant ideal for those restoring an ejector seat or jet cockpit. Further photos available on request. Stock code M21635.